From Casares we headed back towards the the south-western coast of Spain, to a very famous piece of rock (no, not Blackpool, though not so far removed!) – we wanted to call to Gibraltar. We have been there many times before when we lived in Spain. Every time we had visitors it was a regular day out. Some wanted to see “The Rock” for historical purposes, others wanted to stock up on tobacco and alcohol products and Alan’s mum wanted to visit Marks & Spencer as she was getting withdrawal symptoms! If anyone is in any doubt about how British the Gibraltarians feel, we even visited one Monday in June to find everything closed when we arrived including the shops. 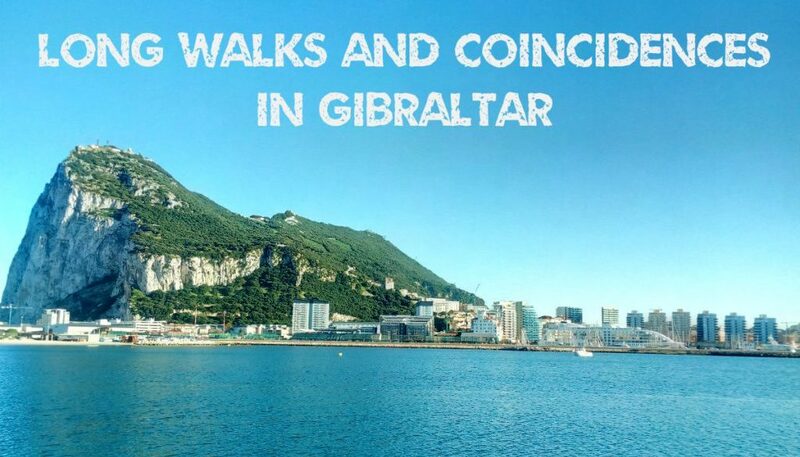 We found out that it was the Monday after the Trooping of the Colour and is a holiday in Gibraltar to celebrate the Queen’s official birthday – that doesn’t even happen in the UK. Another patriotic symbolism is that the main road into Gibraltar from the frontier is called Winston Churchill Avenue. We have tramped up this road and across the runway (yes, the airport runway cuts directly across the main road into Gibraltar), and up and down the shopping streets many times. We took this picture of Gibraltar town from La Linea. Look closely through the trees to spot a Monarch Airlines plane just touching down on the runway opposite. To the left of the trees is a hotel and casino built at the marina in the style of a cruise ship. This time we had decided we might get the cable car to the top of the rock, see the apes, take in the views, explore the nature park and visit St Michael’s cave as we had never done this before. We headed for the Spanish town of La Linea de la Concepción which lies on the Spain/Gibraltar border. First stop was Lidl to restock our dwindling supplies. Once we had packed away the groceries, Alan had spotted a pharmacy across the road and decided to go and ask if he could buy anti-biotics to help try and clear his chest infection. He had suffered from astmatic bronchitis as a child but after a final bad spell aged 15, he seemed to grow out of it. That was until 2 years ago when he took a bad chest infection which resulted in 4 courses of anti-biotics, 3 courses of steroids, an inhaler and a full year before he was feeling better. The lady pharmacist in La Linea offered him a pack of three 500mg anti-biotic tablets made by Pfizer costing €5.40 – not cheap for 3 tablets. One per day for 3 days to see how he felt. He didn’t hold out much hope after being used to taking 4 x 500mg tablets per day for a fortnight at a time. But jumping forward a week, the chest infection had gone. Now he wonders what sort of rubbish we are being prescribed in the UK! It was clear Alan was struggling. As we started to drive out of the Lidl car park, he forgot about the tail swing in the opposite direction to his steering. He had parked near a barrier and caught the back corner of the motorhome shearing off the back corner post which is now just held in position with a couple of screws at the top. Another repair required. There are two potential stop-over points in La Linea, at either end of the frontier. One is an enclosed gravel parking area outside the football stadium costing €4 per night with no services (36.1581, -5.3403). The other is a purpose made aire at the new Alcaidesa marina in La Linea. Tarmac surface and marked out pitches with services, but without electricity costing €12 per night (36.1563, -5.3518). We had just emptied all our tanks and topped up with fresh water before leaving Casares, so guess which one we chose? Yes, for only 2 nights, the football stadium would suffice. We didn’t have the view over a new marina and sailing boats, but we did have a view straight out over the Mediterranean and the eastern side of the rock. Next day we decided to dander over to Morrisons. Alan suggested we take the bikes but for some reason I imagined Morrisons was about 100 yards past the border crossing and airport so we walked – and we walked, and we walked. Alan kept asking me did I not realise it was that far? But every time I had been before I was in the car and really hadn’t a clue. On the way Alan had wanted to get a photograph of a roundabout which commemorates the evacuation of the Gibraltarians during World War 2 as the rock was a major target due to its strategic importance. The first country mentioned in thanks for taking in the evacuees was Northern Ireland and Alan always pointed it out that our little country had done their bit. After about 90 minutes and a lot of “are we there yet” I finally spotted the oasis that was Morrisons. I’ve never been so glad to see a supermarket carpark in my life! A cold drink was needed before we ventured through the masses to get the couple of essential items we needed. We spent about a hour oohing and aahing about the British food we hadn’t seen for almost five months. I was finally able to get three tins of tomato puree which you’d think would be pretty easy to get anywhere but which I’ve been searching for since Christmas, while Alan stocked up with some fig roll biscuits! After we picked up our few essentials it was time for another cold drink. It is fantastic that inside Morrisons in Gib, you can sit at a bar and order a cold beer on tap! While taking our drink, Alan had picked up a copy of the local free newspaper, The Olive Press, and started to flick through it. Inside was a story of how the people of Gibraltar were evacuated during the War and that an investigation was under way as to how 42 evacuees had died in a camp in Northern Ireland! There is a picture of the camp residents standing with a banner which says “You are committing a crime if you intend to leave us in this God forsaken camp this winter. Take us to Gibraltar”! There was Alan’s 8 years of romanticism since first seeing the roundabout monument of how we had helped out during the war GONE in a matter of seconds. Mind you, if you are used to spending your winters in Gibraltar, probably thinking it is cold there, and then you are shipped off to an evacuee camp somewhere in the countryside outside Ballymena, then you are going to find it a bit nippy! On the flip side, the words on the banner also reinforced why we made the decision to leave Northern Ireland and travel around Europe! I have to admit I had a bit of a moment and insisted we catch a bus back to the frontier with our shopping. I just couldn’t have walked the whole way back. You’ll not hear from us of what we do in the week after leaving La Linea. We have booked into a campsite near Conil for us to relax and to recover from our lurgy and for me to recover from that damned walk to Morrisons! We stayed at the football field as well when we were in La Linea. We had actually heard that one problem with staying at the marina is that if the wind was blowing you could constantly hear the sail lines hitting the boat masts, which made for a bit of noise. That hotel/casino built to look like a ship is actually a ship that was built and shipped to Gibraltar and is totally kitted out as a ship. It actually parked under it’s own “steam” into it present mooring spot. Apparently they did this because of the lack of land for more hotel accommodation. If you think your walk to Morrison’s was a long one then you would have hated the one we did from the football field all the way up the Mediterranean Steps and back. We were dead after that! Glad to hear that Alan is feeling better. All the best with your health issues! Looking forward to your following posts! If you ever visit, check out the bus routes around the city. Buses are cheap and aviailable from the fronteir immediately after you emerge from passport control. They can save a lot of walking. ​That Gibraltar’s a quirky little corner of the world isn’t it? we loved it, the ‘Englishness’ so far away from Britain’s shores, like an oasis. We also used La Linea footy car park, before & after our trip over to Morocco and found it perfect for trips into Gib on foot & with Frankie the scoo-ped. Real ale, chips & sunshine…what’s not to like? A few years ago before he died, we were able to revisit the rock with him and he showed us around the various army barracks, all now closed down.